Outside the White House last week, a group that called itself Concerned Citizens of Rochester marched with a 7-ft. poster bearing the words: Biafra Postcard. Staring out from the poster with baleful, bulgmg eyes was a starving child, his ribs protruding and his limbs shriveled. 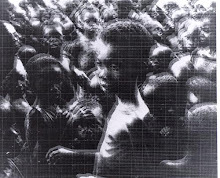 On the reverse side was a message urging President Nixon — who was not at the White House but in California — to act on the concern he voiced during last year's presidential campaign for the Biafrans' plight. Though other crises in other trouble spots have diverted attention from the war between Nigeria and its breakaway eastern region, that plight remains desperate. In England a conference of the World Council of Churches voted to collect $5 million from member churches to aid the people of warring Biafra and Nigeria. The churchmen also called on Nigerian leaders to end an air blockade that has kept many of Biafra's 7,000,000 people on diets that are hovering barely above the starvation level. Kwashiorlcor Again. Cut off from all supplies except by air, Biafra needs 500 tons of food by air each day to supplement its crops. 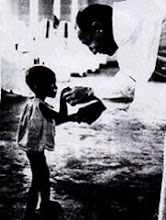 Since the recent downing of a Red Cross food plane by Nigerian MIGs (see color opposite), relief planes paid for by Catholic and Protestant charities have been able to bring in less than 100 tons weekly. 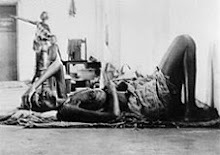 As a result, an often-fatal protein-deficiency disease called kwashiorkor has broken out again, mostly among children. With conditions worsening, Biafra's Chief of State, General Odumegwu Ojukwu, last week sought to break a deadlock with Nigeria over the Red Cross flights. The Nigerians, who shot down the Red Cross plane in retaliation for raids on their territory by Biafran light planes flown by Swedish pilots, have agreed to resumption of the flights —but only if Biafra agrees to meet two stiff conditions. Food planes must fly during daylight to distinguish them from gunrunners who often head at night for Uli, Biafra's principal airstrip, and have proved difficult to distinguish from mercy flights. They must also land at Lagos or another Nigerian airfield to be searched for contraband before proceeding to Uli. 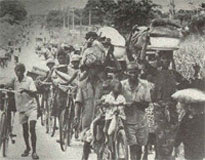 Biafra, which had previously rejected both conditions, finally agreed to the daylight flights but remained adamant against landings in Nigeria. 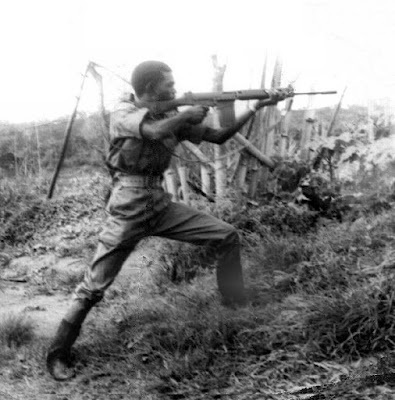 "What's to prevent them," asked a Biafran official, "from seizing a Red Cross plane, loading it with fifty commandos and forcing the crew to take them to Uli to destroy it?" The Biafrans also fear that newsmen and other Western observers will be removed from such planes, thereby depriving Biafra of badly needed foreign publicity. Pressure on Oil. Under such circumstances, the talks on resuming the flights remained stalemated—as does virtually everything else about the two-year-old war. Neither army is able to mount a consistent offensive. Pope Paul, during his African visit, was unable to bring Ojukwu and Nigeria's leader, General Yakubu Gowon, to a bargaining table. Neither were Harold Wilson, Charles de Gaulle or Haile Selassie, who heads the Organization of African Unity, which meets next month in Addis Ababa to discuss the war. To secure independence in any peace discussions, Ojukwu is relying on a strategy designed to embarrass Gowon. With sizable oilfields in the Port Harcourt area and in the mid-western region, Nigeria ranks as the world's 13th oil nation in terms of annual output (anticipated 1969 production: 255 million barrels). By attacking the oilfields, Biafra hopes to press the companies (Gulf, Phillips, Shell, British Petroleum and Italian Agip Nucleare) to talk Gowon into negotiations. Though Nigerian officials admit that oil production has dropped 60,000 barrels a day because of the war, the oilmen insist that they have no intention of interfering in an attempt to achieve a ceasefire. Two weeks ago, to step up the pressure, one of Ojukwu's rocket-equipped Swedish planes hedgehopped to a Gulf tank farm at the mouth of the Escravos River. Biafra claimed that four storage tanks were destroyed by the hit-and-run attack; Gulf said that only one was set ablaze, but it added that one worker was killed and six others wounded.